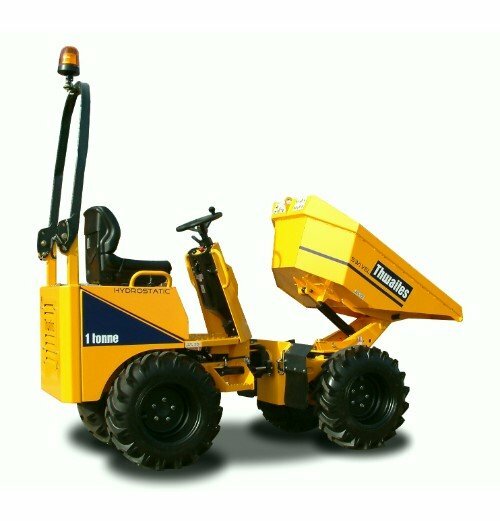 Looking to rent or buy a 1 Tonne Thwaites Hi-Tip? With Depots in Naas – Cork – Dublin, we have you sorted with our 1 Tonne Thwaites Hi-Tip… Call Hireco Plant and Tool Hire today on 045 874 433. We are here to help! Yanmar 3TNV76, 15.9 kW/21.4 bhp (nett) @ 2800 rpm, threecylinder water-cooled diesel. Max torque 66.4 Nm (49 lb f ft). Electric starting, hour meter, battery isolator switch and heavyduty cyclonic air cleaner positioned within the lockable engine compartment. Column-mounted forward/reverse lever with foot pedal speed control. Adjustable suspension seat, accessible from both sides. Audible warning device at key start ‘on’ position. Super-bright warning lights for all critical functions. Electric horn. Hireco Plant and Tool Hire: your one-stop-shop for all Large Plant and Tool sales! Call us today.